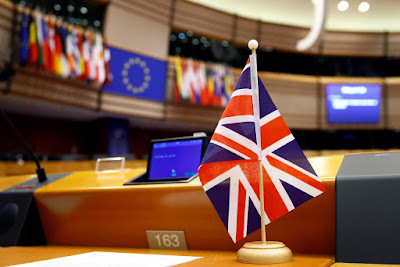 The British government on Monday said it had taken the necessary steps required by law to participate in European Parliament elections in May, but that this did not mean it was inevitable Britain would take part. Britain is due to leave the EU on Friday, but Prime Minister Theresa May has asked the EU for a further delay to Britain’s exit date while she seeks to reach a compromise with the opposition Labour Party in order to get her Brexit deal passed. “As a responsible government today we have taken the necessary steps required by law should we have to participate,” a government spokesman said in a statement. “It does not make these elections inevitable, as leaving the EU before the date of election automatically removes our obligation to take part.” Similarly, Nationalist anti-immigration parties plan to join forces following next month’s EU parliamentary election, looking to create a new bloc to shake up the EU, officials from four groups said on Monday. The move shows growing confidence amongst far-right and sovereignist parties that for the first time since the EU was formed 60 years ago they can win enough seats in parliament to have a major say in how the continent is run. “We want to reform the EU and the European parliament, without destroying them. We want to bring radical change,” said Joerg Meuthen, the Chairman of the Eurosceptic Alternative for Germany party (AfD). Meuthen said that the EU parliamentary bloc would be called the European Alliance for People and Nations. It will initially involve at least 10 parties drawn from the three groups that currently house various nationalist forces. Monday’s event was organised by Italian Deputy Prime Minister, Matteo Salvini, who heads the right-wing League and has been the driving force in persuading like-minded politicians to ditch their previous divisions before the May 26 EU election. “We can propose a new Europe because we have never governed (in Brussels),” Salvini said. “Our goal is to be decisive, to nominate new commissioners in the new commission,” he added. However, it was not immediately clear if two of Europe’s biggest national conservative forces — Poland’s governing Law and Justice party (PiS) and Hungarian Prime Minister Viktor Orban’s Fidesz party — would be willing to join the group. Europe’s myriad sovereignist parties share the broad goals of returning power to EU member states and further curbing immigration. However, they often have very different economic and social policies, making it hard to create a coherent group within the EU parliament. Besides the AfD, the conservative Finns Party and the rightist Danish People’s Party have also pledged to support the initiative. Salvini said his current EU allies, including Marine Le Pen’s National Rally in France, would take part, too. “If we succeed with the initiative we launched today, it will be an historic achievement,” said Anders Vistisen, a European parliamentarian with the Danish People’s Party. “The only powers, who have been winning by us being divided into three different groups have been the europhiles of Brussels, the old establishment parties, who worked toward a U.S. of Europe,” he said. Salvini said he planned to hold a rally in Milan on May 18 to bring together his new alliance. Although all the speakers on Monday confirmed they were united in supporting tougher border controls to prevent illegal immigration, there appeared to be little common cause on other issues, such as economic policy. The AfD has previously denounced the big-spending budget plans of Salvini and the Italian government. Other northern European nationalist groups have been highly critical of what they see as southern European fiscal profligacy. “It is clear that (our) parties have different approaches, but that doesn’t matter right now. What is important is we need to protect Europe,” said Finns Party official Olli Kotro.